Last night I was reading Tom Clancy's latest over-thick book, Dead or Alive. My mother gave it to me for Christmas either this year or last year. I'm about 1/3 the way through. Like most of Tom's tomes it deals with the CIA. 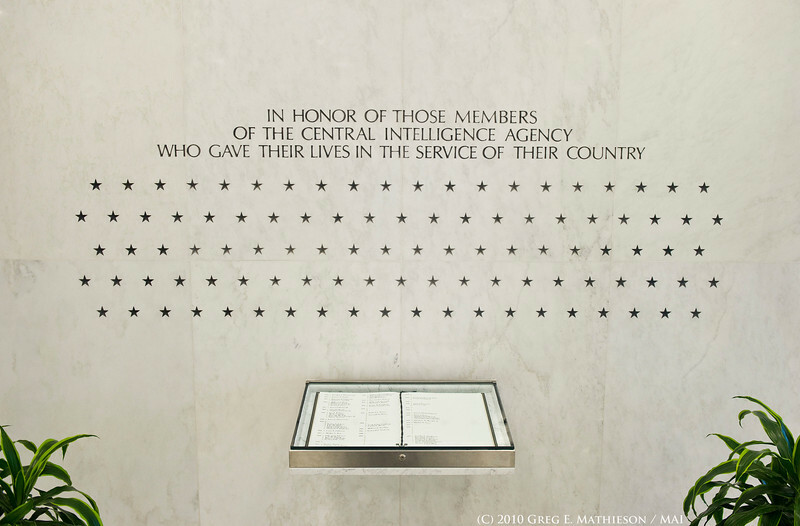 In the book they mention the CIA Memorial Wall in the headquarters at Langley and say that the stars are gold. In that picture the stars look black to me (although they could be gold and inset in the marble so in shadow they look black). To the right was a display with multiple black stars and two flags: an American flag and what I presumed was the CIA flag. I wondered what the whole display represented. Well, with the inscription above the letters it's obvious what it is. Guess it's time for more rewriting again. I've been there. The stars are definitely black but the older ones aren't as dark. The other flag is a blue flag with the CIA seal on it. On the other side of the room is the OSS memorial with a statue. It has a single star. It also has a book (the book of honor) that lists the OSS agents who died in service. Had to leave my cell in the car or I'd have pics for you. Thanks, Graywolf for the info!